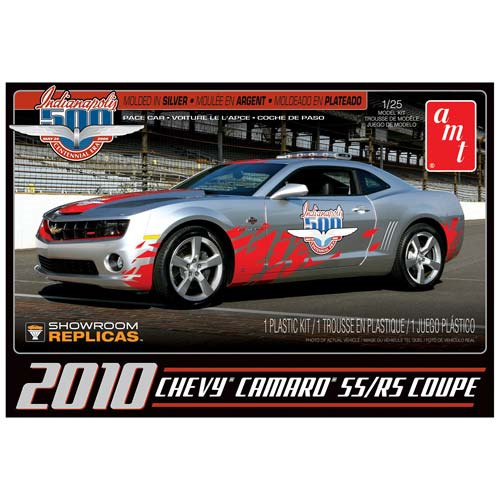 Large full color decal sheet with Indy 500 pace car markings! Just look at the 2010 Chevy Camaro SS/RS Coupe 1:25 Scale Model Kit! The world watched as the 2009 Indy 500 race was lead into action by Chevrolet's upcoming 2010 Camaro. Bring that excitement to your living room! The kit includes a bonus Indy 500 sticker and a Pace Car photo card! AMT's Showroom Replicas kit features a simplified "curbside" style format with a reduced parts count for fast and easy assembly. Skill Level 2. Paint and glue required.